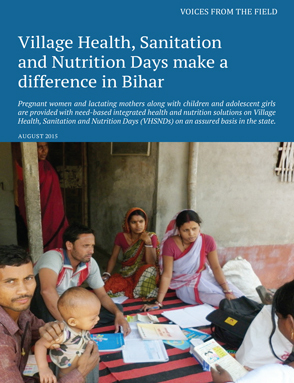 Pregnant women and lactating mothers along with children and adolescent girls are provided with need- based integrated health and nutrition solutions on Village Health, Sanitation and Nutrition Days (VHSNDs) on an assured basis in the state. VHSNDs serve as days when not only health care checks are done and weights of pregnant women and children are recorded, but also where women are counselled on essential nutrition by them and their children. VHSNDs are proving useful to provide services as well as raise awareness on basic health needs among the community.